Spend at least $50 for the biggest savings. Save up to 50% on a selection of baby apparel and gear at Kohls.com. Plus add the code SPRINGTIME at checkout and save 15% on your order. Spend $50 or more and stack the code KIDS10 to save an extra $10 on your order. And earn $10 in Kohl's Cash for every $50 you spend. 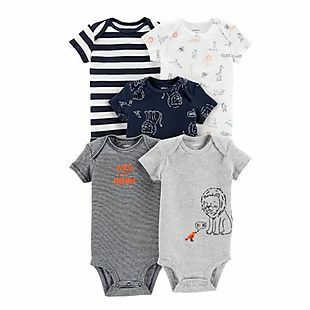 Choose from items like the pictured Carter's 5-Pack of Lion Graphic Bodysuits, which drops from $26 to $14.99 to $12.74. The price falls to $42.46 when you buy four packs. At $10.61 per pack, this is a price low by at least $3. And this Carter's Floral Dress drop from $18 to $9 to $7.65. Shipping adds $8.95 or is free over $75, or you can choose free in-store pickup on many items. Sales tax is charged in most states.